Fort Snelling, 1844, at the confluence of the Minnesota and Mississippi rivers. Painting by C.J. Wild. 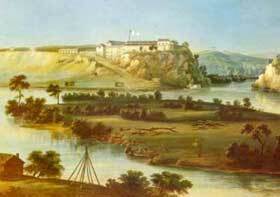 Completion of Fort Snelling in 1823 opened the land to Euro~Americans arriving by steamboat. The Dakota Indians, now living in more permanent housing, became unintentional hosts to countless explorers, artists and adventurers. With the signing of the Treaty of Traverse des Sioux in 1851 the Dakota Indians contracted to live on reservations; in 1854 land was surveyed in Bloomington by the government for official settlement and preemption. Quinn, the first Irish settler, came to Fort Snelling in 1824. Quinn moved to Bloomington in 1842, was and Indian farmer and interpreter in the Dakota and Chippewa languages. McLeod donated four acres of land in 1856 for the Oak Grove Church and the Bloomington cemetery. 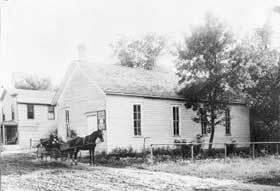 Active in the territorial legislature, McLeod proposed a bill that allowed school children in Minnesota to receive a free education. Sibley was a fur trader and legislator. Sibley led the army in attempt to quell the Dakota conflict and later became governor. Taliaferro was an Indian agent at Fort Snelling. 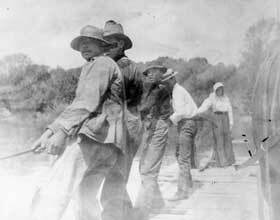 He arranged for the Pond brothers to work at Lake Calhoun as Indian farmers with the Dakotas. Missionary and farmer Gideon Pond arrived in the territory by steamboat in 1834. He settled in Bloomington in 1843 and built a mission near the village of his friend Chief Cloudman, who had moved to the bluffs of the Minnesota River from Lake Calhoun after skirmishes with the Ojibwa. Pond, with his brother Samuel, mastered the Dakota language, worked out an alphabet, edited The Dakota Friend newspaper, and translated portions of the Bible. Pond made further impact on the community as minister and legislator, building a preemption house in 1852 and organize the bluffs overlooking the broad Minnesota River Valley. Gideon Pond's federal-style brick house, pictured right, was built in 1856. It is listed on the National Register of Historic Places and was restored in 1995. The house contains more than 40,000 bricks made of clay from the Minnesota River Valley. 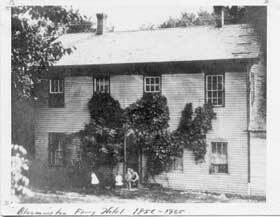 Pond was a carpenter in his native Connecticut. For more on the Pond House and the surrounding area, visit the City of Bloomington Website. 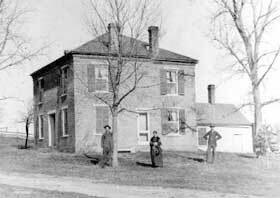 Oak Grove Hall was built by the farmers' Grange organization in 1876 at 102nd and Penn. It served as Bloomington's Town Hall until 1892 when the new Town Hall was built. 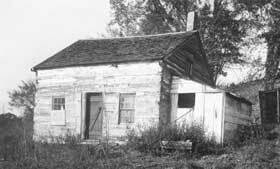 The Joseph Dean log cabin, built in 1852, was later used as a post office at Bloomington ferry. Dean built the first ferry across the Minnesota River with William Chambers. The Bloomington Ferry Hotel, built in 1855, operated for 50 years on the riverside. Oak Grove Presbyterian Church, built in 1856 when congregation outgrew the Oak Grove chapel at the cemetery, was moved to the center of town on Penn Avenue. Moved by four yoke of oxen and a team of horses. 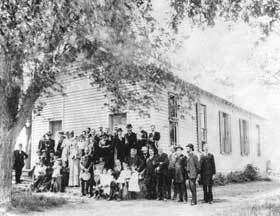 Pond had organized the church in his home in 1855 and became its first pastor. Ferry crew pulling the Bloomington ferry. The Bloomington ferry was built in 1854. 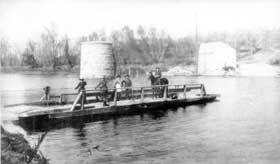 It was important for persons going to Mankato or Shakopee to go to the Bloomington ferry site to cross the Minnesota River. 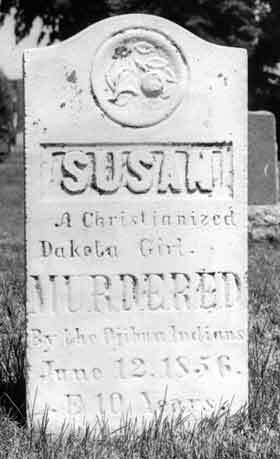 Grave of Susan, a Christianized Dakota proselyte murdered by Ojibwe Indians on June 12, 1856. Her grave is in the Bloomington cemetery.